How to Convert PDF Files to HTML Pages? Are there any software to convert a PDF to HTML format? Please let me know. I have tried Zamzar but everytime I choose the HTML format the converted file is in JPG format. Any help is so much appreciated. Thanks! Do you have the same requirement for changing PDF files to HTML webpages? Actually there are many online converting services and desktop programs are able to batch convert many PDFs to HTML format. However, some online services are not secure enough or 100% work. I tried many online converters but I never got the result I want. For myself, I’d like to use desktop app, which performs stably in converting PDF files to HTML. Here, I’m going to share my personal way of converting PDF to web pages with you. 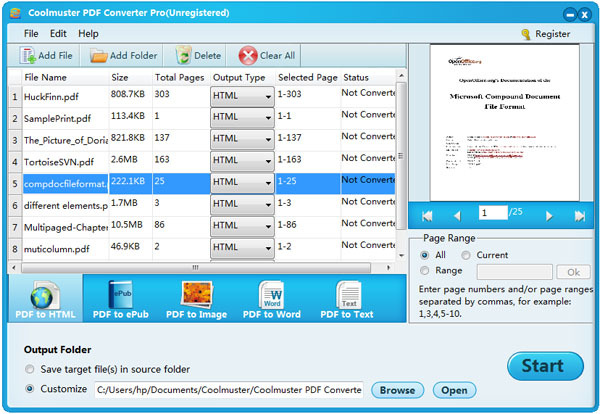 What I use is the Coolmuster PDF Converter Pro, which is an all-in-one solution to convert PDF to 5 different major file formats, including HTML (.html, .htm), Word, ePub, Text and images. As a professional PDF to HTML Converter, you can always get your wanted result with great quality. Download the program to have a try. It works on all Windows platforms like Windows 8, Windows 7, Windows XP, etc. * How to Convert Password Protected PDF Documents? * How to Convert PNG to PDF on Mac/Windows 8/7? Install and launch the program on your PC. Drag and drop PDF files to the app, or you can click "Add Files" or "Add Folder" to load the target PDF files to the software. It supports batch conversion that you are able to upload multiple PDFs at a time. Choose the conversion type as "PDF to HTML" and then click “Browse” to choose an output folder for saving the converted HTML pages if you don't want to put them in the source folder. Tip: One of the main features of the program is that you can set page numbers or page ranges of the PDF to convert specific pages. Do the action in the right program interface. 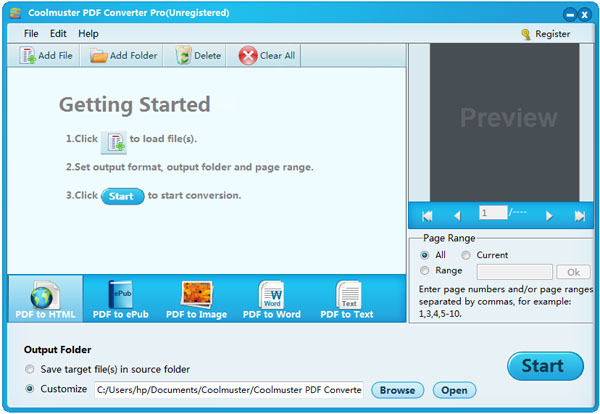 At last, click the "Start" button and let the Coolmuster PDF Converter Pro finish the rest task for you. You’ll get the output HTML pages saved in the folder you have chosen in second step.